I've been searching for a cute rain boot for about seven years. Most traditional rain boots don't go up to a size 11. Also, most rain boots run narrow in the calf. I've finally found a pair. They are cute, they lace up. They are high quality so they won't crack like the last pair I had. And, they are comfortable--so comfortable! 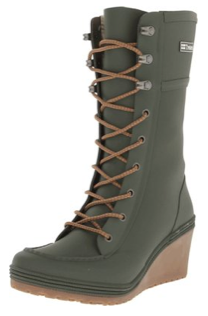 These Tretorn Plask Lace boots come with a removable massage insole that make them a joy to walk in. I nabbed mine when they were on sale for $60, which they aren't right now. (Currently they are $110 on Amazon unless you want the red ones for $48!) Keep an eye out because I'm sure they'll come around again.